Home / #USD / $AUD / $CAD / $EUR / $JPY / $SPY / Will the FOMC Halt the Dollar's Advance? Will the FOMC Halt the Dollar's Advance? Last week's advance was only the second week since the start of May that the yuan moved higher. The optimists claim the firmer yuan, and official comments suggesting capital outflows have eased, show that China does not seek a continued depreciation of the yuan. The cynics warn that by allowing the yuan to rise ahead of the G20 finance ministers' meeting will deflect criticism about its foreign exchange policy, and that the decline will likely continue afterwards. It is tempting to construct a narrative for the dollar's gains based on the string of stronger than expected US economic data. However, the US economic calendar has been light in recent days, and the interest rate channel is quiet. The implied yield of the September Fed funds futures increased by a single basis point. The yield on the two-year Treasury note increased two basis points, while the yield on the 10-year was up less than a basis point. The main drivers in the foreign exchange market can largely be found in developments outside the US. Rate cut expectations in Australia and New Zealand, for example, weighed on their respective currencies. Speculation of "helicopter money" in Japan undermined the yen, until many participants accepted that BOJ Governor Kuroda's June comments noting the BOJ purchases of bonds directly from the government is banned. Sterling was taken down by signs that despite the residual strength before the referendum, there has been a significant hit in sentiment, picked up in the flash PMIs. Draghi said little new at the press conference following the ECB meeting, which left the euro stuck around the $1.10-level. The US Dollar Index rose to its highest level in four months to approach the 61.8% retracement objective of the slide since last December's peak just shy of 100.60. The retracement objective, 97.25 corresponds to the upper Bollinger Band. 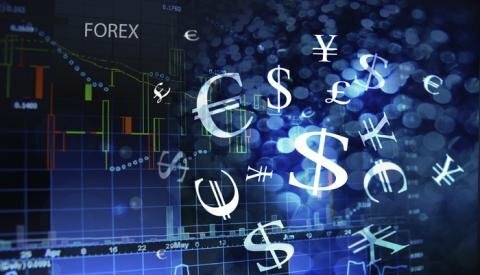 The Dollar Index closed firmly, and the technical indicators we use suggest that there is scope for additional near-term gains. However, given that pre-referendum the Dollar Index was near 93.00, it is not surprising that the indicators are stretched. This warns a corrective or consolidative phase may be around the corner. As the single biggest component of the Dollar Index, the euro's technical condition is similar. It spent last week confined to about a once cent range. It was the first week since the end of January that it did not trade above $1.1100. Prior to the referendum, the euro's five-day average was $1.13. Now it stands near $1.1030. The technical indicators suggest the euro may make new lows, but they may be marginal at best. The $1.0915 low recorded in the immediate reaction to the Brexit decision is the next immediate objective. On the upside, $1.1060 was the best the euro could do post-ECB and downtrend line from the June 24 high and mid-July highs comes in near $1.1030 at the start of the new week and finishes near $1.0970. The dollar pushed higher against the yen and surpassed the JPY106.85 pre-Brexit high before reversing sharply (key reversal on the daily bar charts) on July 21. A month-old (but we think still relevant) interview with BOJ's Kuroda led many to re-think the likelihood of "helicopter money". Despite the bearish price action, there was no follow dollar selling ahead of the weekend against the yen. Technical factors remain constructive and another attempt on the JPY107.50 area looks likely, though a break of JPY105.40 would negate the favorable tone. Anticipation of BOE easing next month was weighing on sterling, pushing it to $1.3065 when a couple of less dovish (than Governor Carney and the MPC minutes) and talked about the need for more real sector data before agreeing to ease policy. The comments, coupled with favorable pre-referendum data helped sterling recover two cents. Then came the terrible flash PMIs and sterling dropped back to the week's lows. Those lows are important from a technical point of view. They correspond to a 61.8% retracement of the recovery from the July 6 low near $1.28. A convincing break of last week lows would suggest the risk of a retest on the multi-year lows. The euro pulled back after appreciating sharply against sterling in response to Brexit. In that pullback it never managed to retrace 38.2% of its rally (~GBP0.8235), and now, technically, looks ready to probe higher again. The immediate cap is near GBP0.8440 and then GBP0.8485. Overcoming these hurdles could encourage a return to the post-Brexit high (~GBP0.8625) . Of the strongest technical signals, the strongest appears to be in the Australian dollar. Even though it did not convincingly penetrate the two-month uptrend drawn off the late-May and late-June lows (~$0.7450), the technical tide appears to have turned lower as the market anticipates a rate cut next month, barring a an upside surprise with next week's Q2 CPI report. The five-day moving average has moved below the 20-day moving average for the first time since early-June. The MACDs have turned lower. The $0.7410 area corresponds to a 50% retracement of the rally from late-May through mid-July. The 61.8% retracement is near $0.7350 and the post-Brexit low was set near $0.7300. A move above $0.7515 would undermine this bearish technical call. Despite better than expected retail sales and a little firmer consumer prices, the Canadian dollar fell before the weekend. The 5.5% slide in the front month oil futures contract to its lowest since May didn't do the Loonie any favors. The US dollar rose to the upper end of its three-month trading range near CAD1.3180, which also corresponds to a 38.2% of the US dollar's fall since late-January. The 200-day moving average is found near CAD1.3315 and the 50% retracement of the greenback's early drop is found near CAD1.3400. Initial dollar support is seen near CAD1.3050. With the latest decline, the September crude oil futures contract has retraced half of its advance form the $34.67 low in late-January to $52.73 high in June. It is found near $43.70, within a nickel of the pre-weekend low. The contract closed below its 200-day moving average (~$44.75) for the first time since May 9. Technical factors suggest the down move is not exhausted. The 61.8% retracement is found near $41.60. The continued increase in the US oil rig count coupled with crude inventories in excess of 100 mln barrels above the seasonal average warns of the unaddressed surplus as the US peak driving season is nearly over. US 10-year yields were unchanged on the week, but they did reached their highest level since the UK referendum near 1.62%. Recall yields had plummeted to 1.31% in the immediate response to the referendum. Given the string of US upside data surprises, it seems increasingly difficult to read into the low long-term US yields as a signal of a looming recession. In particular, as more bonds break through the zero threshold, the more attractive US Treasuries appear. The 10-year yield looks like it put in a near-term peak and is poised to pull back into a 1.48%-1.53% band looks likely. This translates a move toward 132-19 to 133-00 basis the September contract. For the past seven sessions, the S&P 500 alternated advancing sessions with declining sessions, but still managed to climb higher in this saw tooth fashion. Last week's little more than 0.5% gain sufficed to extend the streak into the fourth successive week. This is the longest streak since the Feb-March rally. There has been practically no pullback since the July 6 low near 2074.The technical indicators are stretched and the momentum seems to be flagging but there is very little on which top pickers can count. The weekly charts and technical studies suggest more room to the upside.